Back to basics tip #21: Elle’s favorite toys are not toys. I don’t know why I even buy toys. She favors pens, glue sticks, tape, pretty much anything office supply and craft supply. Anyway, one day she decided to grab a bold blue pen and create a beautiful drawing on the white couch cover. To remove the ink before company came the next morning, I grabbed a bottle of rubbing alcohol and poured some on the ink. 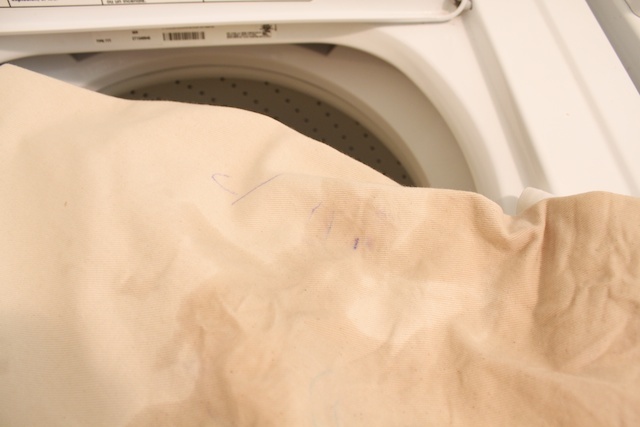 Rub it a bit and toss it in the washer with your regular laundry detergent. Wash and dry. This works on clothes too from ball-point pen ink. 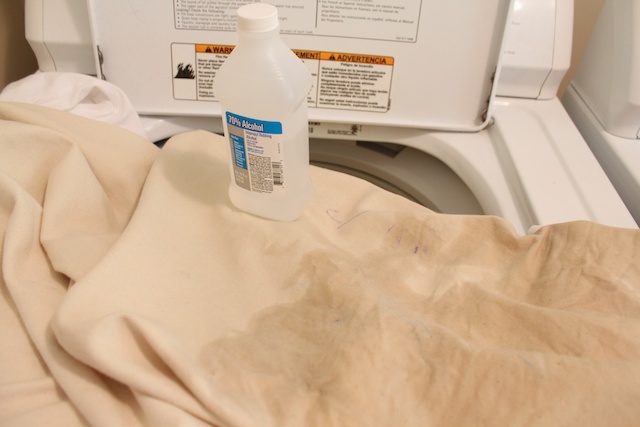 » Tell me… What’s your stain removing trick? I use hairspray for ink … works like a charm. To get tomato-sauce stains out of clothes, I just hang them in a window. And I hardly ever use stain-remover on my kids’ clothes, I do just as well using the soak cycle (more time, but hands off time at least!) and a bit of oxiclean. And lastly, to remove the FUNK 😉 from towels and workout clothes, I have good success washing in vinegar. the ingredient in hairspray that takes away the ink is alcohol. so i use alcohol because it doesn’t have all the other hairspray ingredients. but if you don’t have rubbing alcohol around, then hairspray works too. i soak my kids clothes too. but glad to hear you use oxiclean. i’ve never used it before. I use hairspray too! It’s amazing! And you don’t have to wash it out. Good to know! My little one loves to get her hands on ballpoint pens! it should. give it a try. Glad you have slip covers! I tried hairspray but it didn’t work. Maybe it was the ink (the kind that’s supposed to stop check fraud)? Anyway, with stains, make sure they’re gone after the wash cycle before drying them. The heat of the dryer can set them permanently. My favorite tip is getting grease stains out of clothing. I start by trying Dawn dish soap directly on the stain, rub a bit, then wash regularly. If there still are grease stains, then I “reactivate” the grease by spraying the spot with a little bit of WD-40, followed by Dawn dish soap. Works every single time! As been said in previous posts. I always use hairspray. I have a great tip for grease stains…it’s called Goop. It is a hand cleaner, and you find it in the automotive section at Walmart. Rub it in really well, let it sit for about half an hour and wash. The stuff is amazing!! Thanks for the tip! I’d never heard of using alcohol. It has a weird name, but Fels Naptha laundry bar is the most incredible stain remover I’ve ever seen. I live in a house with 3 toddlers. Believe me, this little bar can take out anything they can get on their clothes! I will be using this handy tip. thanks for sharing. I have only just found this site! I use milk to get pen stains out of clothing… give it a soak and a rub then throw into washing machine. My mother-in-law told me that her grandmother) who would be about a hundred and fifty used Fels Naptha on EVERYTHING. Her laundry, her hair and her face. She said she had the clearest, most gorgeous skin and her hair was amazing, even at sixty. I love it for stains and keep it in a jar of water so it is like a goopy mess. I just take a tooth brush and rub it into the clothes and it works like magic! Where do you buy Fels Naptha? Get a dry erase marker for the new washer and dryer. Just color over the mark until it loosens the old ink then wipe off before it dries with a paper towel or cloth. Works on shapie anywhere you can wipe off. Though I didn’t have rubbing alcohol at hand when I noticed ball point marks on my tan poly-suede toss pillow, I did have alcohol wipes…they worked!